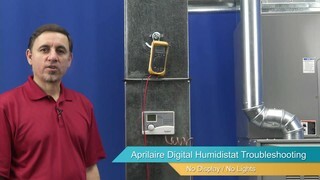 Hi, I'm Jay, and today we are going to talk about how to diagnose your Aprilaire digital humidistat. Ok, this digital humidistat has no display right now. So, we're going to check for electricity to make sure that it has power, if it doesn't have power, the problem is ahead of it somewhere. If it does have power and the display is dead, that's a bad humidistat. Ok, let's take the cover off and check for voltage. Ok, we're going to check at the R terminal and the C terminal. And according to my meter, I have .001 volts so I have no power here. So we should be reading anywhere from 0.22 to 0.29 volts at this point. Since I don't have any electricity, the problem is probably in the furnace, or a transformer somewhere, but it is not with the humidistat. If I had power here, and the display was blank like this, I would have a bad humidistat, which would need to be replaced. Thank you for watching. For this and other product, visit us at AirQualityParts.com.